My face goes through a bit of trauma because of this blog. No, I don’t have sensitive skin, and no, I don’t react to things very often. But I do switch up products regularly in the name of testing and reviewing, and it was refreshing to go into trial period with Zweena Argan Rose Rejuvenating Face Serum because of one word: Simplicity. Made with just five ingredients (argan oil, organic rosehip seed fruit oil, organic evening primrose oil, organic pomegranate oil and organic Moroccan rose flower oil), Zweena Argan Rose Rejuvenating Serum comforts stressed skin while enveloping it in a bouquet of fresh roses and fruit. 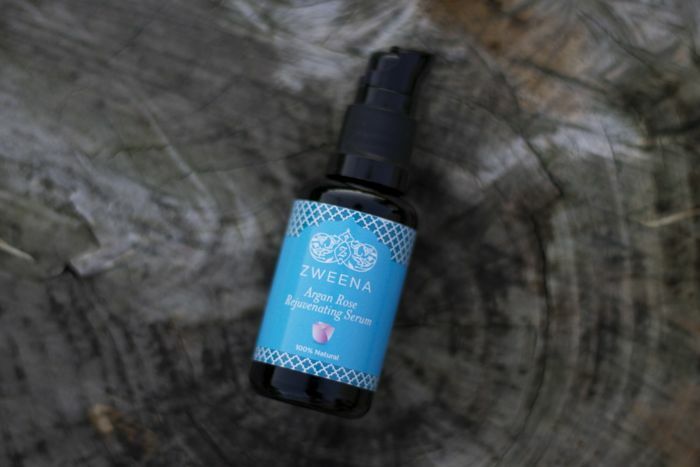 I will admit that Zweena’s Argan Rose Rejuvenating Serum is not the most exciting or exotic face oil I’ve tried. But sometimes a little restraint (or editing, as we say in my world) makes for something so chic that it feels new again. I found myself feeling a bit more beautiful while using this oil (roses can do that to a gal), and that’s testimony enough to the power of simple beauty. This isn’t a miracle oil for acne breakouts or for when you’re praying to the skin gods for a little miracle for your big night out. This is an oil for lavishing in your own natural beauty, imperfections and all, and enjoying an aromatic treat that puts you in the right mood at either the beginning or end of your day. Have you tried anything from Zweena? What do you look for in a facial oil — simplicity in ingredients or a jam-packed powerhouse? Tell me in the comments section!